Rivet produced another performance full of promise when running out the head winner of the Group Two over seven furlongs this afternoon. The 7/4 favourite had to battle hard to get past the leader, and runner-up, Thunder Snow as the field quickened up and the front two pulled well clear of the third, D'Bai, in the final furlong. It looked for one moment that the runner-up would hold on to his lead but, when jockey Andrea Atzeni gave his mount a couple of cracks of the whip, Rivet responded gamely to get his head in front well inside the final furlong and held onto his advantage in a driving finish. Trainer William Haggas, who was recording his third winner of the Ladbrokes St Leger Festival and moves alongside Roger Varian at the head of the top trainer leaderboard, was pleased enough with the performance of Rivet following the race. "He is lovely-looking horse and a good mover - he is a nice horse," said the trainer. "He has had a race today and I thought he was a bit laboured. I think he is doing quite well physically and I need to assess this and see it again. "He looked to make heavy weather of it but he won and that's all that matters really. I would definitely like to run him again this season but, whether that is over seven furlongs or a mile, I don't know. He's in every smart race that I could find, so we will take it from there. "I'm thrilled to bits but I need to see it again to assess it. They pulled clear of the third in a slowly-run race, which is a good sign. Andrea said he would get a mile and now probably wants it. He thought the ground was a bit loose on top for him but, all in all, he's won and, when you come for a race like this from a maiden, you hope they do. "The Racing Post Trophy back here (October 22) is a possibility but I don't know whether I've put him in (he is entered). I think he's a good moving horse but a lot of his family have liked top of the ground. All the jockeys who have ridden him so far like him so hopefully they can't all be wrong. "His owners, the Starship Partnership, are an eclectic mix. Des Scott, a 87-year-old South African, is marvellous. He's had horses for 60 years, most in South Africa. There's also a certain L K Piggott (Lester), who bred Rivet's dam, Starship and also Messrs Tabor and Magnier. I'm pleased to say they leave it to us, which is fantastic." The Saeed bin Suroor-trained and Godolphin-owned Thunder Snow (2/1) finished a close runner-up in the opening race on day four of the 2016 Ladbrokes St Leger Festival. Under James Doyle, the two-year-old son of Helmet raced in second before going to the front with a quarter-mile remaining in the seven-furlong contest. However, Andrea Atzeni, registering his fifth winner of the week at Town Moor, came with a late swopping run aboard 7/4 favourite Rivet to deny Doyle and Thunder Snow victory by a head in a thrilling finish. Another Godolphin runner D'Bai (8/1) trained by Charlie Appleby and ridden by William Buick was a further five lengths back in third. Bin Suroor said of his colt: "I'm pleased with Thunder Snow's run. I'm happy with how he finished his race and he saw out the trip well. He has finished second in a Group Two which is a good result. "This horse will certainly improve in the future. He may have needed this race after coming off a break of 45 days [Goodwood, July 26, beaten one and three-quarter lengths] so he will improve for the race." The Godolphin handler suggested the G1 Dewhurst at Newmarket [October 8] was a possible target for the colt. He remarked: "There are no plans at the moment for him. He may go for the Dewhurst." Charlie Appleby was pleased with the performance of D'Bai who stayed on creditably from the back of the field to finish third. Appleby commented: "He is a horse officially on ratings who had a lot to find and the first two are very smart. 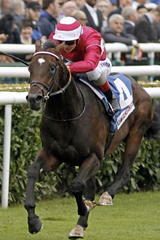 "He is a Dubawi and he has more of a profile to be a three-year-old. He has lost nothing in what he has done there today - he's been placed in a Group Two." Appleby suggested that would be the horse's last run of the season. He said: "I'm happy enough with that. We will put him away for the winter now and we'll see him as a potential Listed and Group Three type of horse next year when he strengthens up again."